RENO, NV – March 4, 2014 – Lithium Corporation (OTCBB: LTUM) (the “Company”, or “Lithco”) iis pleased to announce that it has recently received approval from the Bureau of Land Management for its application to amend its permit on its San Emidio Lithium property. The Company intends to drill up to three deeper lithium brine tests in an area on the San Emidio playa where lithium enriched brines have been encountered at shallower depths. Drilling will occur in the area of a lithium-in-brine anomaly outlined by two drilling programs in 2012. This anomaly is approximately 3 miles (5 kilometers) long, and 0.6 miles (1 kilometer) wide at its widest point. The peak value seen within the anomaly is 23.7 mg/l lithium, which is 10 to 20 times background levels seen outside the anomaly. The Company believes that the playa at San Emidio may be conducive to the formation of a “Silver Peak” style lithium brine deposit. Past drilling may indicate that the anomaly occurs at or near the intersection of several faults that may have created the structural setting necessary for the formation of a lithium-in-brine deposit at depth. The Company is currently negotiating with drilling contractors, and ground conditions permitting, the Company intends to begin drilling this prospect in the second quarter 2014. 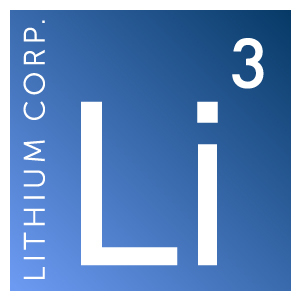 Lithium Corporation is looking forward to 2012, and has plans to further explore its Fish Lake Valley, and BC Sugar prospects as well as continuing with its generative exploration program.